In Southern France, the Ardèche River flows through a spectacular landscape. Surrounding the river are white limestone cliffs, covered with vegetation, rising up over hundreds of feet. Over the river runs the Vallon-Pont-d’Arc, a natural arc like the one at Arches National Park. The cliffs on either side of the river are perfect places for hiking and that is what Jean-Marie Chauvet and his two friends, Éliette Brunel and Christian Hillaire were doing in December, 1994 when they chanced on a narrow entrance within the cliffs. When you enter through this obscure shaft which was hidden for twenty millenia, you reach a dark cave with high ceiling where there is not much to see. If you have seen any Ramsay Brothers or Ram Gopal Varma movie, this is the point where you scream and run as fast as possible. Fortunately Chauvet and his friends explored the caves and as they went through the network of chambers they saw not just animal bones or stalactites, but undulating cave walls painted with spectacular animal images. And they were 30,000 years old. Some of us may enter Mt. Athos, but we will never enter the Chauvet Cave. The cave is closed to public. But then if the French culture minister is a big fan of your movies you may get the once in a life time opportunity to film inside the cave. 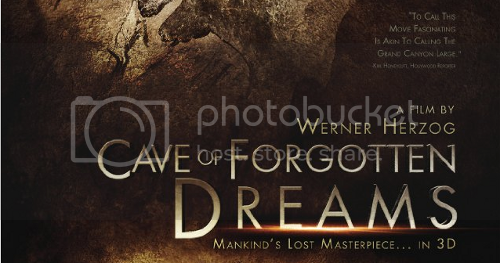 This is how the Bavarian film maker Werner Herzog (Aguirre) got permission to make this 3D documentary. But even then there were too many restrictions. The crew had to minimal (3 people). They had to use only hand held cold lights and always stay on the narrow walkway. They would be allowed inside only for a few hours every day. Despite such restrictions, the result is a spectacular film. Since the cave was naturally sealed by a landslide for more than 20,000 years, it is like walking into a time capsule. The walls are filled with drawings of horses, bisons, lions, bears and mammoths. In one depiction, there are a bunch of animals running and to give the impression of running, the artist chose to depict the animal with multiple legs, similar to how you do in modern cartoons. You can call them the precursor to animation. Drawn during the period when Neanderthal man roamed alongside humans and Europe was covered with glaciers, the images are lifelike. They seem to be telling various stories: of fighting and mating and of hunting and movement. But there are no human depictions. The documentary also reveals the amount of care taken by the French to protect the caves. This has not been developed into a tourist site because the visitors’ breath could bring mold on the paintings like what happened in Lascaux. Even the scientists stay on the narrow metal path so as not to plant their foot prints next to the 20,000 year print of an extinct cave bear. For tourists, they are planning a replica site nearby. The other impressive thing is the research that has been done in these caves. Every inch has been laser scanned and specialists have looked at every artifact. Near the opening there is a wall with hundreds of hand prints and they belonged to a man who had crooked fingers. Deep in the caves, researchers found another painting which was done by a man who too had crooked fingers. 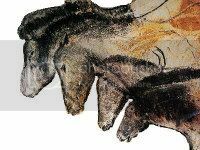 The Chavuet painters used torches and some of them rubbed those flames against the cave walls leaving 28,000 year old charcoal fragments. A surreal moment is when Herzog tells us about two sets of foot prints: one belongs to a bear and the other to a child. Did the bear eat the child, or were they friends or were the foot prints made thousands of years apart? Again, we don’t know. What makes this a non-boring documentary is Herzog’s commentary. His imagination is quite wild. Standing in the silence, looking at the art, he says one can hear one’s own heartbeat and the sound track switches appropriately. The cave paintings remind him of Fred Astaire’s dancing with the shadows and we get a visual from Swing Time. Then he gets the most wonderful characters to explain the past: a circus employee turned archaeologist, a scientist who walks in reindeer skin, a perfume maker who sniffs for smells in caves. These are very unique Herzog touches. This is probably the only documentary I have seen in a theater and it was worth it. What does the world’s oldest art say about us? The New Yorker article that inspired Herzog. Where can one see this movie in India? Aneesh, Not sure about that. I saw it abroad.